Bring Back the Beauty of your Deck! The Beautiful Deck Company now offers its own specially-formulated selection of premium deck care products. Unlike most competitors, our formulations will not damage the fibres of your decking, or contaminate surrounding soil. They contain NO dulling bleaches, ineffective acids, troublesome sodium percarbonate, or any ozone-depleting additives.With our Ultimate Deck Care Products environmental responsibility doesn't have to come at the expense of performance! These 100% Biodegradable products keep decks looking beautiful and in peak condition. Their performance and ease-of-use consistently amazes both professional contractors and individual deck owners. INCREASE THE APPEARANCE AND VALUE OF YOUR HOME - FOR PENNIES PER SQUARE FOOT !!! 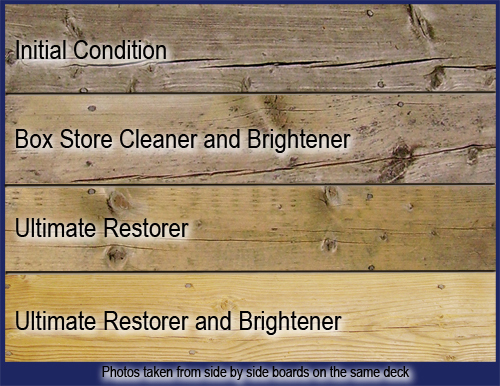 Our "Ultimate Deck Cleaner - Step 1" followed by our "Ultimate Citric Brightener - Step 2" accomplishes the restoration shown in these photos for less than 7 cents per square foot !!! 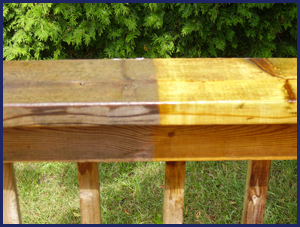 No other do-it-yourself project offers anywhere near the return on investment achieved by restoring your deck with these revolutionary products.